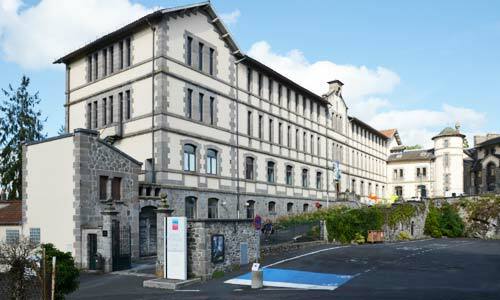 In south central France, the pretty town of Aurillac is the capital of the hilly Cantal Department. The harmless-looking green hills that cushion the town have a more violent history. They’re the remnants of the largest stratovolcano in Europe, measuring 70 by 50 kilometres and towering to 4,000 metres. It’s a far cry from the landscape that you’ll encounter today, with rounded hills grazed by shaggy salers cows. Aurillac is an endearing town set on a precipitous slope, with houses and monuments made from pinkish basalt. It’s a place devoted to the arts, putting on a street theatre festival in Augus that invites troupes from around the world. 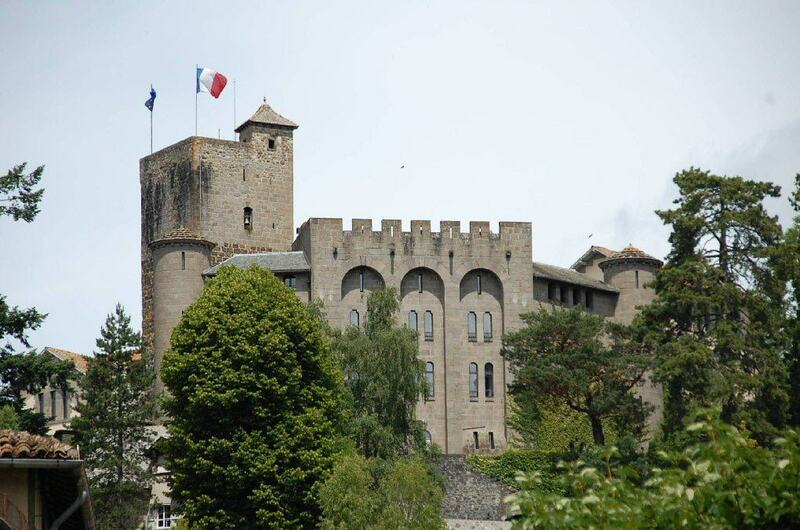 Still marshalling Aurillac from its lofty crag, this castle goes back as far as the 800s. But what greets you now is a blend of medieval architecture and a later, 19th-century mansion. The tall, square-shaped medieval keep sticks out against the more romantic rounded towers of the newer château. This newer part was actually modelled on the famous Papal Palace in Avignon. And as well as housing the Volcano museum, which we’ll come to next, also holds a regional centre for environmental initiatives. And even if you’re not up for visiting the museum, you should still make the climb to look down on Aurillac from the upper terrace. Four halls in the left wing of the Château de Saint-Étienne host this museum for all things volcanic. With the help of models, computer terminals and a collection of minerals gathered in the 18th and 19th centuries you’ll get to know how volcanoes function and their impact on humans, plants and animals. The first room reveals the inner-workings of the earth and how volcanoes and mountains are formed, then there’s information about the Cantal region’s geology. After that there’s a gallery detailing man’s relationship with volcanoes, followed by the evolution of the Cantal landscape since the glaciers melted. Ina 17th-century Visitandine convent that later became the National Stud Farm, this museum is a useful window on local life down the ages but also has some worthwhile art. History buffs will be drawn in by Neolithic tools like the double-edged polished axe, while an excavation at the Roman Temple of Aron in Aurillac revealed a funeral coir with a glass urn completely unscathed. For art go up to the second floor where there’s a sculpture of Rodin by Camille Claudel (the pair famously had a long, eventful relationship). And you can also check out a section about umbrellas, as at one time Aurillac produced half of all the umbrellas in France. 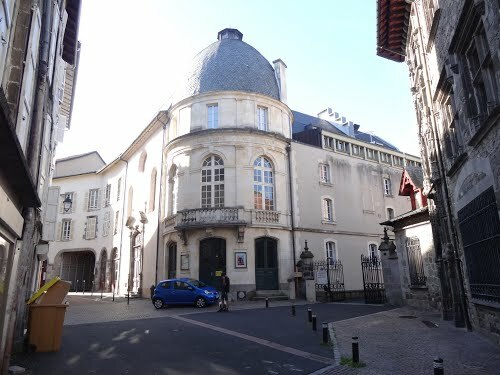 When you’re in Aurillac don’t rule out the local theatre, which is a palatial stone building on Rue de la Coste. As we’ll see later, Aurillac has an affinity for the performing arts, and this theatre is a regional cultural touchstone. The programme is well-curated, hosting an edifying blend of dance, music of all descriptions, literary talks, poetry readings, magic and live comedy. There are also short-term exhibitions at the theatre’s gallery, mostly for contemporary painting, photography and graphic design. Every August, this small town is invaded by more than 100,000 spectators who come for the annual street theatre festival. This has now been going for more than 30 years and is attended by street troupes from all over the world. Some 500 show up each year, bringing raucous fun, whimsy and magic to the streets for four crazy days. There are hundreds of little shows going on all over Aurillac by day, and in the evening everyone comes together for a big party. In the week building up to the festival is the smaller “Les Préalables” event, when the various companies arrive in Aurillac and introduce themselves to the town. Down the ages the River Jordanne has cut a canyon from the local volcanic breccia. This ranges from 20 to 60 metres in depth and runs for around four kilometres through deciduous woodland. It’s a scenic and family-friendly trip, with a specially plotted walking trail that crosses the river twice via wooden bridges. Remember to tread quietly and you might be able to see otters in the water. Where the ravine gets steep there are wooden walkways, and it’s worth persisting because the trail ends at the breathtaking Liadouze waterfall. Like the Château de Saint-Étienne, this marvellous 15th century property is perched on a steep rocky spur and commands distant views. The castle has menacing towers with machicolations, which were later accompanied by more refined living spaces added in the 1600s. The château was given a refit at the start of the 20th century when the interiors were decorated in their current Neo-Gothic fashion. Curiously there are also 20 waxwork models depicting the noble Pesteils family, made by the Musée Grévin in Paris. When you come to Aurillac’s tourist centre, check to see if you’ll be in time for one of the special events held at the château in summer. For instance, there are medieval themed days with jesters, jousting and stunt shows with swordfights. 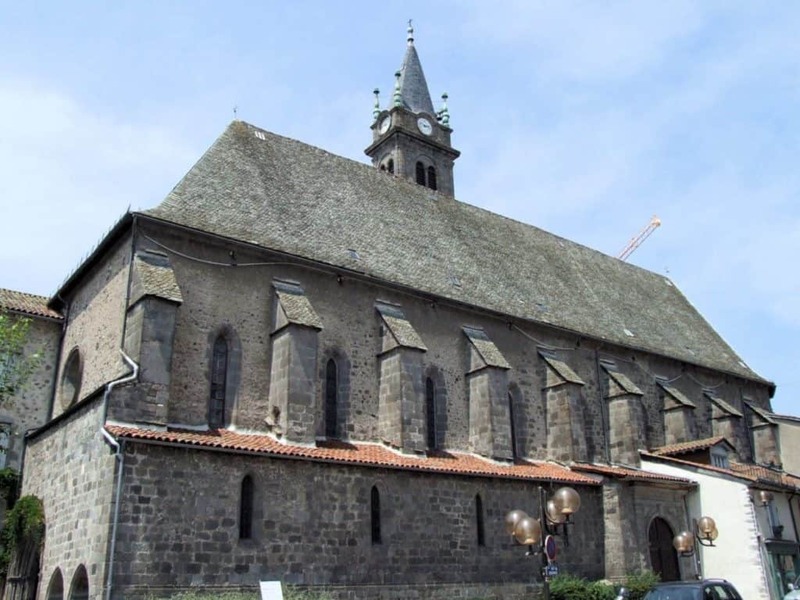 Although the building is now just a parish church, the Abbaye Saint-Géraud was founded as long ago as the 9th century. In its time it was a respected centre of learning, and Pope Sylvester II (also known as Gerbert) studied here in the 10th century. The church has come though many violent periods like the French Wars of Religion in the 16th century when it was razed by the Calvinists. The whole thing had to be rebuilt in the 19th century. And while there isn’t much left of the original structure medieval historians might be thrilled to know they’re in a spot visited by some giants of the early middle ages like Robert II of France, Pope Urban II and of course Pope Sylvester II. 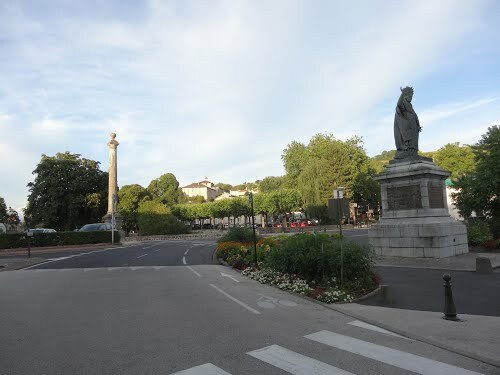 Gerbert (Pope Sylvester II) has been immortalised in this square by the Jordanne River. 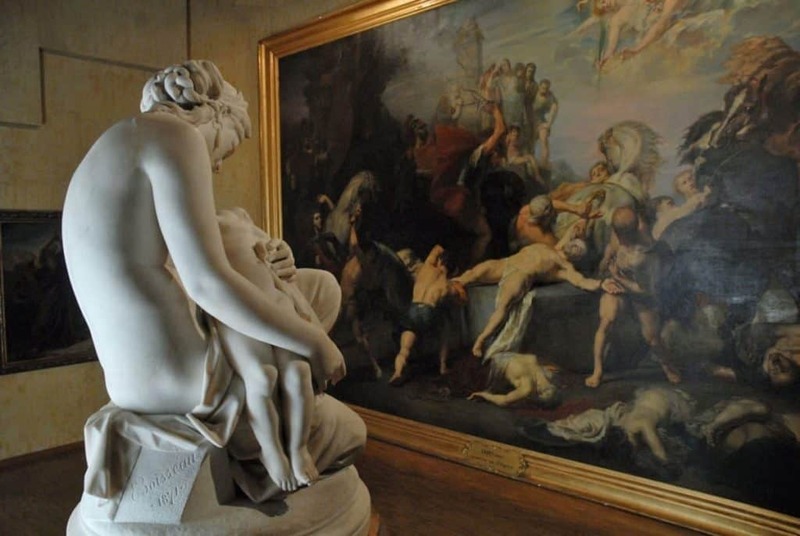 His statue was sculpted by the vaunted 19th-century artist David d’Angers whose works ended up in the Louvre, Pantheon and Père Lachaise Cemetery. Gerbert stands across the way from Alexis Joseph Delzons, a son of Aurillac in the First Empire who rose to the rank of general before the age of 30 and died in the Battle of Maloyaroslavets. Place Gerbert is a gorgeous scene, especially on the riverside, where there are pollarded plane trees, rustic houses with wooden balconies and an old wooden lavoir where the townsfolk would do their laundry. The tree-fringed square in front of the Abbaye Saint-Géraud is a good spot to contemplate the church, but has its own story tell. One of the buildings here, the Ancienne Hôtellerie, is exceptionally old, as you’ll be able to tell from the Romanesque arches on its facade. This was a medieval hostel for people visiting the abbey while walking the Way of St James pilgrimage route. The fountain at the centre of the square has a darker shade than the pink-hued building around, and that’s because it was carved from serpentine rock. It’s a basin that was also part of the abbey and dates to the 1100s. Also rooted in a defunct monastery is this handsome 15th-century church built from volcanic stone. The Notre-Dame-aux-Neiges used to be attached to the Convent of the Cordeliers, and still has a couple of the old monastic buildings. The church’s sacristy is in the former chapter room, and here there’s some vibrant decoration remaining since medieval times. Take your time to admire the Romanesque Black Virgin statue in the oratory, which depicts her covered in golden robes and with baby Jesus on her knee. The Cantal mountians with their high rounded peaks and grassy slopes are not to be missed. And while the range is woven with hiking trails and mountain biking tracks you may prefer to see them in total comfort. In which case nothing beats the Route des Crêtes, which starts right in Aurillac and snakes towards the Auvergne Volcanoes Regional Park. There are several places on the way where you can park up for photos or to explore a walking trail for few minutes. The route will also have special meaning for road cyclists as several Tours de France have come via this route. Further into the Regional Park is the highest peak in the Cantal Range. The Plomb de Cantal climbs to 1,855 metres, higher than any other mountain in the wider Massif Central bar the Puy de Sancy. It’s a majestic setting today, but before it collapsed in on itself millions of years ago this thing was an absolute monster. 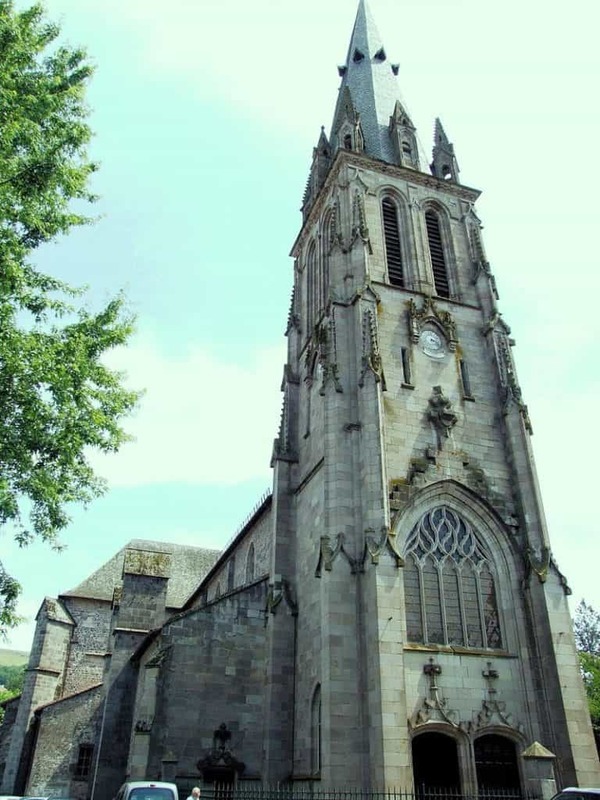 Back then the Plomb de Cantal was some 4,000 metres tall and had a diameter of 80 kilometres. Today, despite its size, the mountain is easy to reach and you’ll have several ways to scale it: There’s a cable-car serving the peak, but you can also walk from the lower cable-car station in around 90 minutes, or ride up by mountain bike from the Prat-de-Bouc pass. As with Aurillac, the adorable village of Tournemire is built from volcanic basalt and has an upland setting that will take your breath away. The village rests far above the Doire River on an escarpment on the right side of the valley, and the view of the woodland and pasture below is one to linger over. 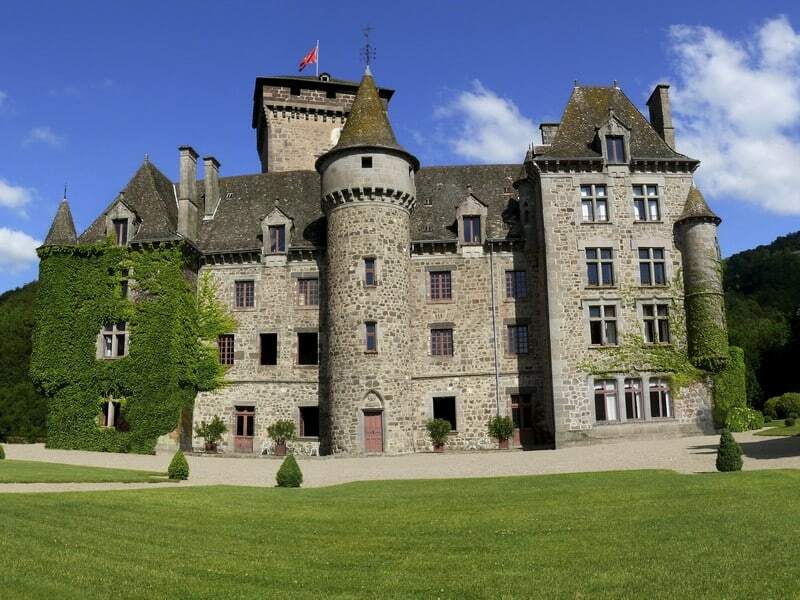 The Château d’Anjony is made from that same pinkish basalt and was erected between the 15th and 17th centuries. It’s a wonderful castle to mill around, with a chivalric knights’ hall, a chapel with medieval frescos, lots of Renaissance decoration and a kitchen with a cavernous fireplace. In a hilly region populated by herders the food needed to be simple and satisfying. And to this day the staples in the Cantal are buckwheat, chestnuts, rye, ham, cheese and vegetables. 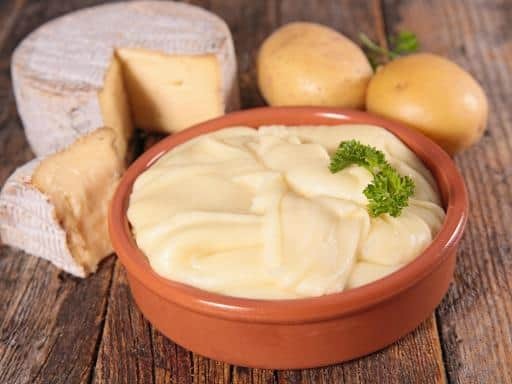 Potatoes show up in aligot, which is mashed potatoes with tomme cheese, cream and garlic, or truffade, a similar preparation with sliced potatoes instead. Cantal cheese meanwhile has been made since the Gauls and has a hard texture as it is matured for several months . It’s produced with milk from Salers cows, and has an earthy scent that will remind you of the meadows they graze in!